Tina has been a technician with Milwood Animal Clinic since June of 2000. 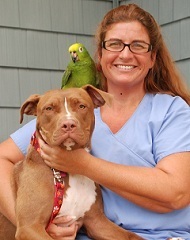 She has worked in the field of veterinary sciences for many years. She has an associates degree from KVCC and Lake Michigan college, both as an EMT Specialist and a Medical assistant. Tina's pet family consists of dogs, cats, and birds. Her hobbies are shopping, gardening, camping, and riding her Harley in the summer. She has a special interest is avian behavior and medicine. Tina enjoys the people she works with at Milwood, the exotic pets we treat, our dedication to client education and how we work hard to fulfill our mission statement.